Periodontal treatment becomes necessary when inflammation and infection spread below the gum line to jeopardize the health of our gums and jawbone that hold our teeth in place. Retaining our teeth is directly dependent on appropriate and timely periodontal care and ongoing Periodontal Supportive Maintenance. Like a frame that surrounds a beautiful painting, healthy gums enhance the appearance of our teeth. Gums that are unhealthy-infected may become swollen, painful, turn red, bleed and recede. In later stages, the supporting bone is destroyed and teeth can shift, loosen and eventually fall out. Periodontal disease if untreated, spoils much more than our smile. These changes affect not merely our ability to chew and speak, but impact on our overall health. Periodontal disease represents a progressive bacterial infection that spreads from the gums to destroy the bone supporting your teeth. In adults, plaque-induced inflammation represents the largest cause of oral health issues and is divided into two categories: gingivitis and periodontitis. Gingivitis represents reversible inflammation of the gums. If untreated, infection can progress to periodontitis. Periodontitis involves inflammation and infection that has spread to cause permanent destruction of the bone that supports our teeth. Dental plaque has been shown to be the primary cause of periodontitis. Plaque is a sticky colorless film composed of a multiplicity of bacteria types. Over time, dental plaque forms an ever expanding symbiotic ecosystem which adheres to our teeth and spreads below the gum line. Plaque constantly forms on teeth, even minutes after cleaning. On the other hand, it is the interaction of millions of bacteria over time that establishes a toxic bacterial ecosystem continuously secreting poisons that destroy the gums. Gums can become inflamed, red, swollen, and bleed easily. If infection is permitted to proceed without effective treatment, the gums separate from the teeth causing spaces (pockets) to form. Over time, plaque hardens to form a rough, porous substance commonly known as tartar (calculus) both above and below the gum line. Gingivitis if untreated can progress to periodontitis resulting in the permanent loss of the supporting gum and bone that hold our teeth in place. This progressive loss of jawbone can lead to the loosening and subsequent loss of teeth. Periodontitis results from the interplay between disease causing bacteria adhering to our teeth and an overly aggressive immune response to these bacteria. It has been reported that 80% of Canadians will be afflicted with periodontal disease by age 45 and that 1 out of 5 patients with this disease are unaware they have it. Despite periodontal disease being a dangerous infection, at its early and still treatable stages, it is often painless and devoid of profound symptoms. This underscores the importance of presenting for specialty evaluation and treatment at the earliest possible stage. Early diagnosis and effective treatment will reduce the severity and cost of your care, while improving the predictability of achieving case success. 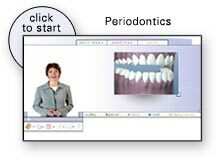 There truly is no substitute for early periodontal specialty evaluation.